Looking for a reason to have yet another piece of chocolate? We'll give you five. These sweet DIYs have us reaching into the candy bowl again and again. On the spectrum of vice, there are many things worse crimes than having a sweet tooth. Sure, doctors and dentists tell us that candy’s bad for our health. But we know of at least one good thing that results from a candy binge—the wrappers. 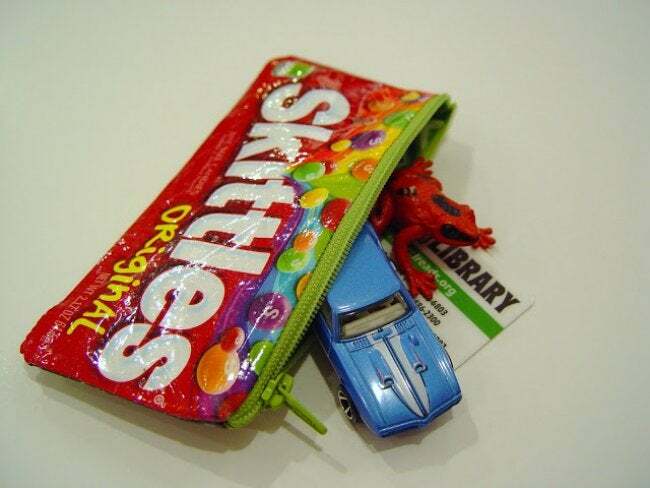 For people who like to make things, colorful candy wrappers are wonderful, endlessly versatile challenges to creativity. Scroll down to see five snapshots in the afterlife of your favorite chocolate bars and sour treats, and who knows? You might start buying candies based on their packaging. Or if not, you’ll at least have a new reason to indulge your hunger for the sweet stuff. Yum! Hit the jackpot on Halloween? Once you’re done feasting, ride the sugar high by shaping the wrappers into links that lend themselves to many amazing creations. Here, in a stroke of delicious irony, wrappers were repurposed to make a waste basket. No appetite? 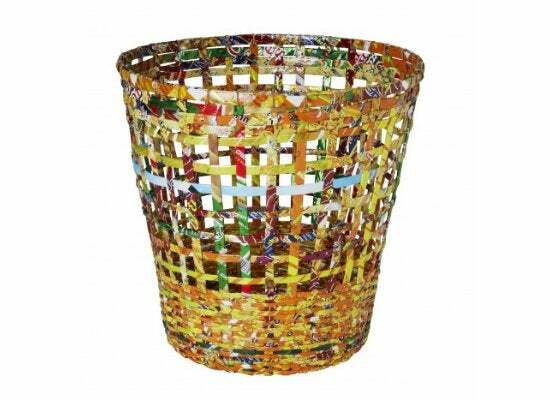 Buy your basket pre-made from Ten Thousand Villages. 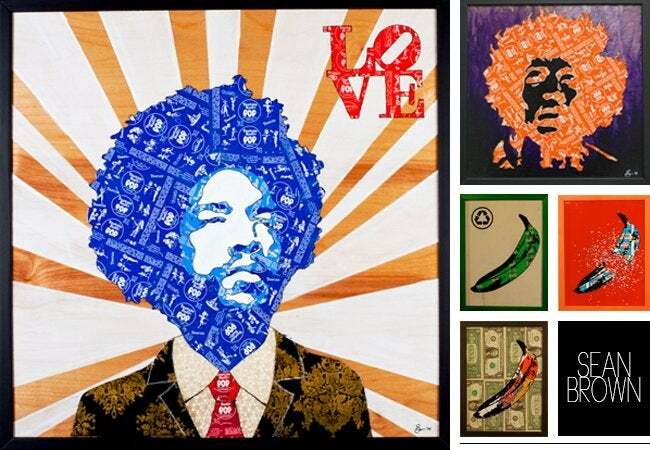 Take decoupage to a whole new level, following the lead of Sean Brown, whose preferred art supplies are colorful candy wrappers. The average person probably couldn’t conjure a Warhol-style Marilyn on the first try, but you might be surprised by the beauty you can bring out of things like Starbursts and Tootsie Rolls. Transform your Halloween discards into Thanksgiving decor! 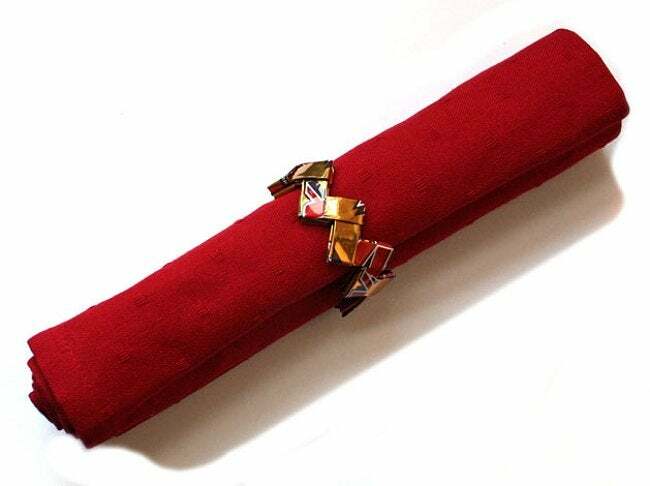 To make these candy wrapper napkin rings, you need only basic crafting supplies to get started (think scissors and a glue stick). Visit RePlayGround for help mastering the origami-like technique, and soon you’ll be completing a full set for your dining room. Honor your favorite candy by preserving the original condition of its wrapper along the way toward creating a small pouch. Use it as a wallet or to corral miscellaneous bits and baubles. Besides the wrapper, you’ll need some iron-on vinyl and a zipper. Head over to Punkin Pattern for the full instructions. 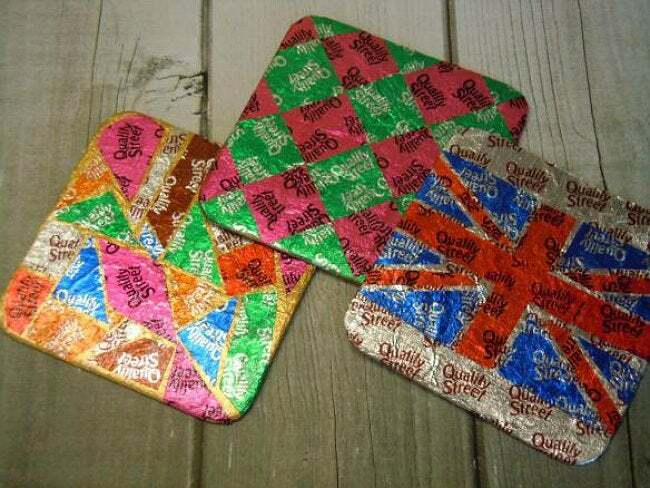 Coasters crafted from cardboard and bright, glimmering wrappers manage to say, “See me? Set your drink down here.” Bloggers at Re-Creations Project used foil from Quality Street, a confection company popular in the U.K. But leftovers from any foil-wrapped treat would work equally—that is to say, exceptionally—well.